India is the 7th largest country of the world by area. India accounts for 2.4 percent of total world surface area. 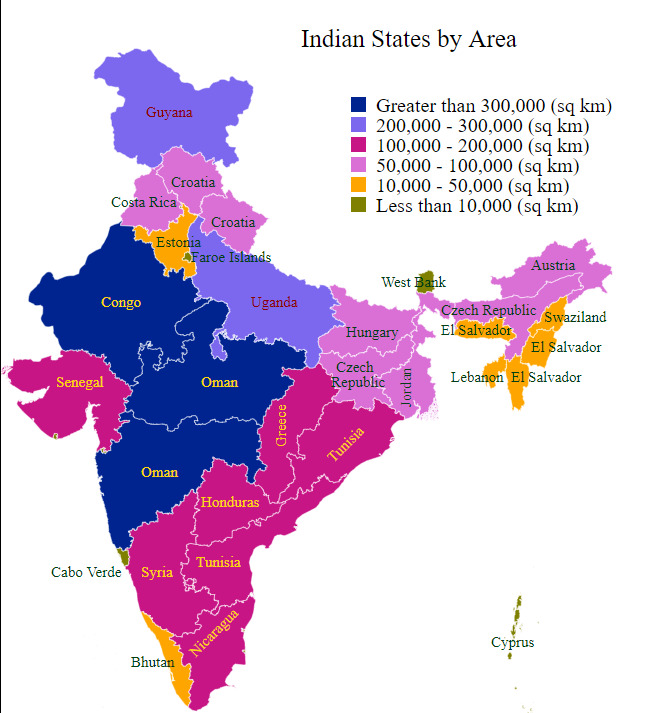 According to Ministry of Home Affairs, Goverment of India, area of India is 3,287,469 square km or 1,269,298 square miles. As stated in official source, Area figures of jammu & kashmir includes the area under unlawaful occupation of Pakistan and China. The area includes 78,114 sq.km. under illegal occupation of Pakistan, 5,180 sq. km. illegally handed over by Pakistan to China and 37,555 sq.km. under illegal occupation of China. Agricultural Land is approx 1.41 mn sq km as it covers 42.89% of total area. Forest Land is 764,566 sq km. Rajasthan is largest and Goa is smallest state of India in terms of area. With area of 342,239 sq km. Rajasthan accounts for 10.41 percent of total country's area. Size of Rajasthan is slightly greater than Congo, 64th largest country of the world. India's largest state Rajasthan is more than 92 times bigger than smallest state Goa (3,702 sq km). Rajasthan is followed by Madhya Pradesh and Maharashtra. Madhya Pradesh is larger than Maharashtra by a narrow margin of 532 sq km. Uttar Pradesh is at 4th and Jammu & Kashmir is at 5th place. Top 5 Indian states shares 43.24% land of country whereas top 10 shares 68.85%. 12 states have area greater than 1 lakh sq km. If we compare area of top 11 states with countries, these 11 states will comes under top 100 countries of the world. Among the union territories, Andaman and Nicobar Islands (8,249) ranks first whereas Lakshadweep with area of 60 square km occupies the lowest rank. 5 union territories has area less than 1,000 sq km. 5 largest districts are : kachchh (gujarat - 45652), Leh (Jammu & kashmir - 45110), Jaisalmer (Rajasthan - 39313), Bikaner (Rajasthan - 28466), Barmar (Rajasthan - 28393).